1.Boosts signal for 2G/4G Verizon,Sprint,U.S. Cellular 2G/3G/4G T-Mobile,AT&T. 2.Dual Display with Dual Band Signal booster. 3.All components needed for installation in one package. 4.Nice appearance, High-quality and Easy installation. 1*13m Cable + 3m Cable (White Color). Step1. Search a position where can receive good signal by your cell phone (more than 2 or 3 bars). After that you can install the Outdoor Antenna on that location, towards to the base station or Cell Tower. Step2. Use the 13m cable to connect the Outdoor Antenna and Signal Booster. Step3. Connect the Indoor Antenna and Signal Booster by 3m cable. Step4. After finished all parts then please check all connectors well again and trun on the power. Step5. The Installation is Complete. The booster kit includes an booster, an outdoor antenna, the outdoor antenna can pick up good mobile signal from outside of your house, and send the signal through cable to the booster, the booster can amplify the signal, then the amplified signal can transmit the signal into your house, so you can enjoy clearer phone call or faster mobile date inside your house. 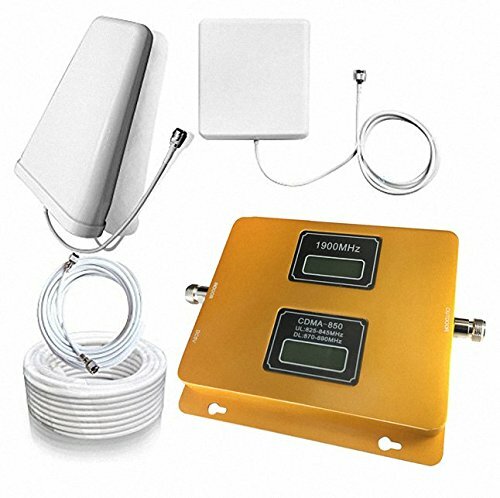 Dual Frequency Cell Signal Booster With Dual Display:850MHz+1900MHz. Can Enhances 70 dB For Your Cell Phone Signals. Performance Guaranteed: Manufacturer 2-year warranty and 30-day money-back guarantee. Compatible With All North American (U.S. And Canada)Carriers.2G/3G/4G T-Mobile,AT&T,Verizon,Sprint Etc. Fantastic Appearance: GOLD color for Dual Band Signal Booster, White color for Indoor Antenna, Outdoor Antenna and 2 Cables. Compatible With All U.S. 2G VOICES Signal and Most U.S. 3G Networks: Works on 2G/3GVerizon, 2G/3GAT&T, Sprint et. Furthermore, this Sanqino booster also support a few 4G Signal, such as 4G LTE AT&T, 4G LTE Sprint, which frequency is 850Mhz or 1900Mhz.